This volume of cutting edge sports music picks up where it's recent predecessor left off. 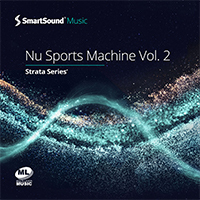 Still comprehensive in scope and designed to cover almost any type of sports visual imaginable, it adds a fresh take on every sports style: From epic orchestra-driven rock, to electronica-action, hip-hop funk and power-guitar that will blow the doors of your visuals. As with the previous release these Multi-Layer tracks can be easily customized with all of Sonicfire Pro 6's powerful tools, and especially benefit from SmartSound's unique ability to build intensity over time with its Mood Mapping and Variations tools.